Delivery software for delivery and fastfood restaurants. 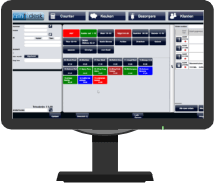 The professional POS delivery software system that is equipped with a touchscreen, which ensures that you can enter your order in a few simple steps. Entering orders reliably, easily and quickly saves you time and ensures quality. That is why CashDesk is a real sales booster for your company. Prefer to use a PC? 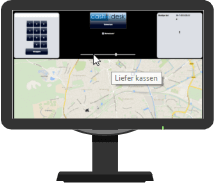 CashDesk also works with a keyboard and mouse. What does our delivery software do? Manually entering address to search for a route is a thing of the past. CashDesk shows the route directly. Whether it has to do with orders, your expenditures, or the funds carried by couriers, CashDesk has everything under control. Automatically import orders from Take Away, Just Eat, Hungry and other ordering sites. You can also manually enter orders in less than a minute. Has a customer ordered before? All the details for this customer are then known in CashDesk. The next order can therefore be entered even faster and... the customer feels like the king! CashDesk has set up the only system with an extremely ingenious link with the big food ordering sites such as TakeAway.com, Foodora.com and many more. See all links. These orders come directly to your register! Copying out emails and faxes is forever a thing of the past. Links with your existing website are also possible. 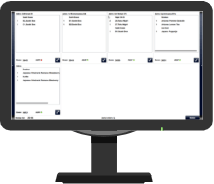 Three dashboard functions make the status of an order in the process immediately clear: the register, in the kitchen or with the delivery staff – of course with the right information for each worksite and of course printable. For the delivery staff, there is even an option of printing with a map. Cash orders are automatically counted for the delivery driver. This means there is always a check on your cash flow. Lost track of an order? CashDesk notifies you when the order processing time is too long. Many options can be set through the management function. 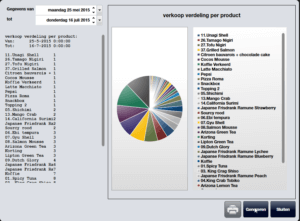 This makes CashDesk adaptable for small and for large delivery restaurants. The customer file makes it immediately clear who your customers are and where they are located. Smart options are also included here, such as customer recognition based on previous orders. With our unique telephone link, you see immediately who is calling, and the details become visible in CashDesk. Your customer feels acknowledged, and it avoids unnecessary waiting times at the counter and on the phone. You can immediately start entering the order. For new customers, we make the input even simpler. Entering a postal code and house number is sufficient. The online postcode check shows the correct street name and city. In the courier function, you immediately see which drivers are signed in and which orders are ready to be delivered. 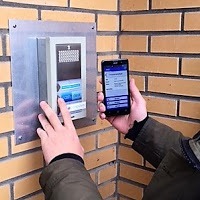 Extra security is built in that ensures your delivery staff are never carrying too much cash. 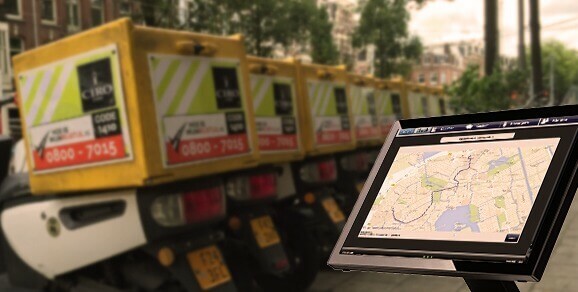 A trip tracker shows at the end of the shift which trips have been taken by which courier. Want to know where your drivers are? With our special driver APP (GPS track & trace), you can see exactly where the couriers are located. The register software provides automated tracking of the start and end times so that you can easily link these to your payroll package. Next to the order process, thought has naturally also been given to management reports. 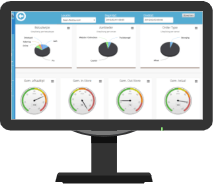 Your revenue development can be tracked and managed directly. 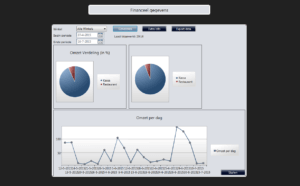 Various reports and graphs make your operations clear. There is a simple function to easily export your revenue details to your bookkeeping package. 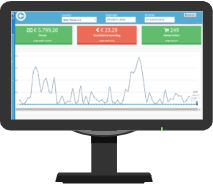 CashDesk is not only an order processing system, but also a marketing instrument. Multiple marketing tools ensure that your own website gets more visitors and produces more orders! We help you to calculate what this can mean in your case. It often amounts to thousands of euros on an annual basis. Saving is “hot.” The customer punch card, anno 2016: A complete loyalty program to connect with customers and have them order through your own website. With our blog, we regularly give important marketing tips that you can use yourself. Need help? We also offer marketing solutions. As a franchiser, you want to keep control over the affiliated restaurants. Our portal for franchiser offers an answer to all questions – completely live and “in the cloud,” of course. Comparisons with previous days, status per order, a complete labor calculation, KPIs and much more. 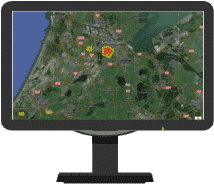 Would you like to know exactly where your customers are located? Check the heatmap and you can see that. 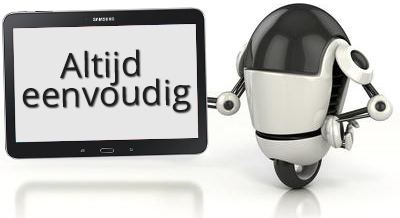 CashDesk is a 100% Dutch product with Dutch support, also during the (delivery) hours critical for you. CashDesk is suitable for any Delivery and Take Away Restaurant.